Thanks, have you stayed at either one? If so could you recommend either of them over the other? Living in NYC I have never needed to stay at any of these properties, but I have put clients up in them. The Jane is very quaint and does not have all the amenities as the Maritime. I have had single clients stay there and they were happy with it. Basically a place to just sleep and not spend any time in the hotel itself. I think the Maritime would be better for a couples weekend with more amenities to offer. FYI - all the hotels in NYC have smaller then normal rooms. 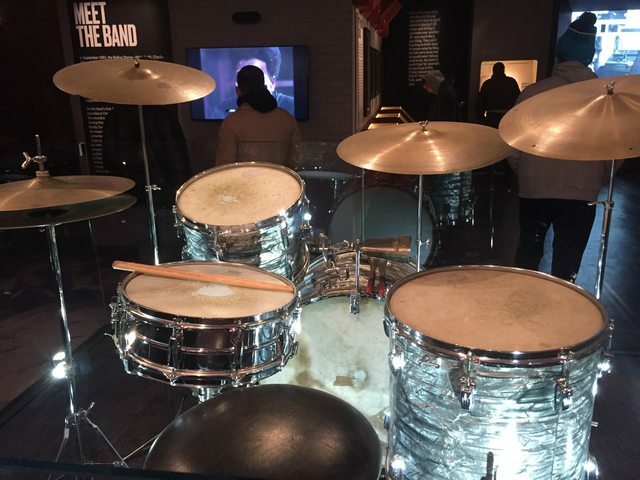 my husband and i just got back to chicago from nyc to see exhibitionism. we stayed at the avalon hotel, which is in midtown and not so close to the show but a short cab ride away. wonderful room with 2 double beds, sitting area, nice bath and shower with double sink, refrigerator. our 6 nights averaged about $200 u.s. per night. great location (near empire state building) with restaurants, broadway, macy's a short walk away. this hotel ran over $500 per night during the christmas season, but in february was a relative steal. don't know what rates will be in march. on the other hand, if you stay at a cheaper hotel with a shared bath, you may be able to better afford items in the exhibitionism gift shop, like the waterford water glasses (set of 4, $280.00!). Exhibitionism will be in Chicago opening April 15th. 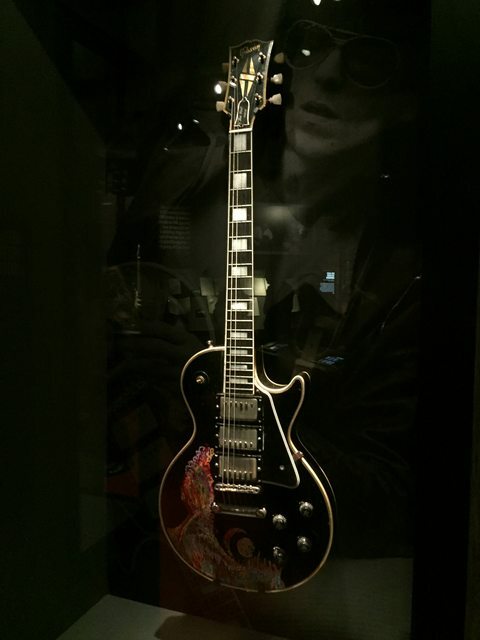 Exhibitionism is coming to Chicago! The Rolling Stones’ first ever major exhibition, Exhibitionism, delivered by DHL, will make its Chicago debut at Navy Pier on April 15, 2017 and will run a four-month engagement through July 30, 2017, proudly brought to the US by Jackson. The Chicago engagement follows the exhibit’s global premiere in London and its star-studded U.S. premiere in NYC, both of which garnered rave reviews and drew huge crowds of music, art and fashion lovers. Exhibitionism is the largest touring experience of its kind ever to be staged, and the first time in history the band has unlocked their vast private archive exploring the very beginning of their history to the Stones’ superstardom of today. Tickets for Exhibitionism will go on sale to the general public on Feb. 24, 2017 at 10:00 a.m. There will be an exclusive Early Bird Offer of a 25% discount on limited edition commemorative VIP tickets from Feb. 16-21 only. Group tickets for 10 or more are available by calling Broadway In Chicago Group Sales at (312) 977-1710 or visiting BICGroups.com. Fantastic news. Would rather a show, but this is exciting! Edited 5 time(s). Last edit at 2019-01-16 18:05 by Irix. STILL HOPING FOR A WEST COAST STOP BETWEEN CHI-TOWN AND SYDNEY. "after New York, it will move to Chicago and somewhere on the West Coast before heading to Australia"
cool. it is coming near me although navy pier can be a real bummer to us locals. "Nice bit of silk, Em." What bugs me about the outfits section; where they have Jagger's jumpsuits from '72/'73 - in the forefront they feature this white number, with studs, and I have never seen a picture of Jagger wearing this. There were several in US 72, white ones, but not like that. I am convinced some of the outfits are replicas/repros. well they are and are so labeled i.e. Mick's outfit from Hyde Park '69. Got my v.i.p conformation for Chicago! Edited 1 time(s). Last edit at 2017-02-21 20:46 by bleedingman. Posted this in the JJF video thread [iorr.org] , but thought I post it here too. 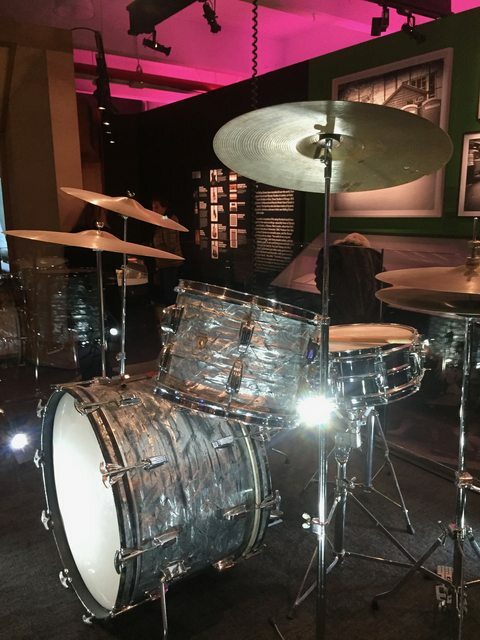 Keith black Gibson guitar & Charlie's Ludwig drum kit from the JJF video are on display at Exhibitionism. An amazingly cool video for so many reasons. btw -- if you haven'r seen Exhibitionism and you have the chance, go see it. Been there twice -- it's so well done, so interesting and so much fun. I've talked to many non-Stones fans who've gone and had a great time. If you're a Stones fan, you're going to love it. Exibitionism Surprise: That's not the Ya Yas version of Honky Tonk Women! Sorry if this has been posted elsewhere, but has anyone else noticed in the "Remix" stations that the live version of Honky Tonk Women listed as being from "Get Yer Ya Yas Out" is not actually the version you hear? 1.There are no horns on the Ya Yas version like on the remix station. 2. There's no organ on the Ya Yas version like on the remix station. It did not sound like 73 or 71 to me either. Also, both Undercover Of The Night and Start Me Up sound like alternate versions of the final tracks - especially Undercover which does not have the post-production effects like the final release. Re: Exibitionism Surprise: That's not the Ya Yas version of Honky Tonk Women! It's from The Brussels Affair. PS: You should have checked out the others. I did. Undercover and Start Me Up both sounded different as I mentioned above. Only did a quick pass on Miss You. All those versions are different - great stuff! Nicky Hopkins the real star of the show! Late to the party ... can someone please tell me where you can hear these? Is there a link to it? I didn't see it at the site. It appears that you need to actually go to Exhibitionism to hear them. i'm delighted to report that chicago's premier rolling stones tribute band, beggars banquet, will be performing on navy pier just a stone's throw from exhibitionism on saturday, july 1, 5:30 p.m., at the miller lite beer garden. these guys are terrific, and i'm sure a good time will be had by all. navy pier is a great place to experience our lakefront in the summer. there will also be fireworks off the pier at about 10:15 p.m., and rumor has it they may be synced to stones' music.